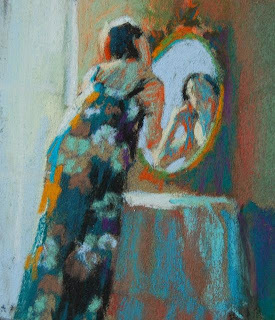 Meg at the Mirror is one of the small pieces I'm preparing for the Cherry Creek Art Festival in Denver. For about 15 years I made my living selling my pastels through galleries and outdoor art festivals. During those years, there were probably about 10 festivals in the US that required original only work, no reproductions, and those were the shows I preferred. People were more knowledgeable about art at those shows, and were more willing to pay for it. And the chance that I'd wind up parked next to someone selling bird houses made of popsicle sticks was pretty slim. Not that there's anything wrong with making bird houses out of popsicle sticks. But about 4 years ago, art sales slowed down, hotel and gas prices leaped, and art festivals started doubling their booth fees. It was getting harder and harder to make a profit. Especially when you consider how much of my time was spent traveling to and from the shows, which were in Denver, Sausalito, Chicago, Miami, New York... So I started teaching instead, which turns out was a good choice. But I miss driving cross country. I thought I'd give it a try again. So I'm headed to Denver in July, with a van full of small framed pieces and plans to enjoy time on the road with my husband. Would love to see some of you there. I would love to come to your festival, but it is a bit far from Australia. It sounds like lots of fun.